Years in the making, Grant Morrison’s The Multiversity has thus far delivered precisely what readers have learned to expect from a new superhero event by Morrison: dense meta-commentary, intriguing takes on familiar concepts, and spectacular artwork by some of the industry’s top talents. All three of those elements are spotlighted in this preview of next week’s The Multiversity: The Just #1, which features alternate-universe versions of Damian “Batman” Wayne and Alexis Luthor discussing the nature of comic books while dealing with the latest invasion from another dimension. Ben Oliver’s sleek linework and forward-thinking design sense make him a great fit for Morrison’s story about an Earth where the children of classic superheroes are now viewed as celebrities, and Dan Brown’s coloring adds a sheen that makes everything appear especially fresh and new. 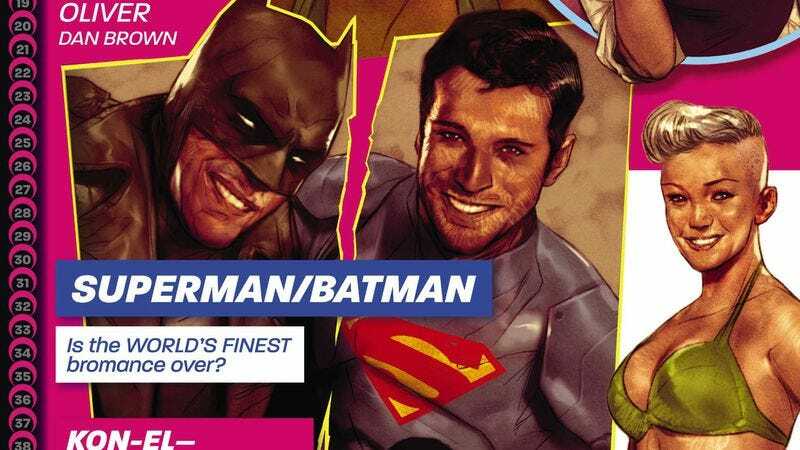 Judging by the cover, this issue presents a version of the DCU that is heavily influenced by the state of real-world pop culture and celebrity, and that concept should give Morrison plenty of opportunities to dissect superheroes in a new context. These first five pages alone are packed with commentary on themes ranging from the status of comics as art to the changing superhero reader demographic. As Morrison delves deeper into this world, readers can expect further insights from one of comics’ most unconventional thinkers.